:What does it take to feel good--and do good--in work? More money? Money falls short, says Dean Niewolny, whose finance career, four houses, boat, plane, and astronomical paycheck still left him restless. Call it smoldering discontent. Like most achievers, Dean found himself craving work that matters. Now for almost anyone in any career--just starting, midway, or wrapping up--Dean has the goods. With deep insight from his personal journey, Dean lays out the path to a career with purpose. (Sometimes the career changes; always the heart does.) Readers get self-assessment tools and clear steps wrapped in twenty years worth of stories, hard-won wisdom, and grace. A person can know what he or she was wired to do--and how to get there. 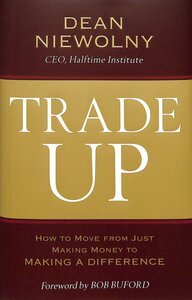 About "Trade Up: How to Move From Just Making Money to Making a Difference"
Dean Niewolny spent more than twenty years in executive roles with three of Wall Street's largest financial firms, finishing his career in the financial sector as market manager for Wells Fargo Advisors in Chicago, where he oversaw a $100 million market. In 2010, Dean traded his marketplace career for Halftime to help more people who, like him, wanted to expand their own "first half" success and skills into passion and purpose for meeting human needs and making a significant difference. Dean joined Halftime as managing director and, in 2011, became the CEO. He speaks at events around the world, encouraging business leaders to channel first-half achievement into a second half defined by joy, impact, and balance. He and his wife, Lisa, have two children and live in Southlake, Texas.